Size: 8 1/2" x 11" (overall). 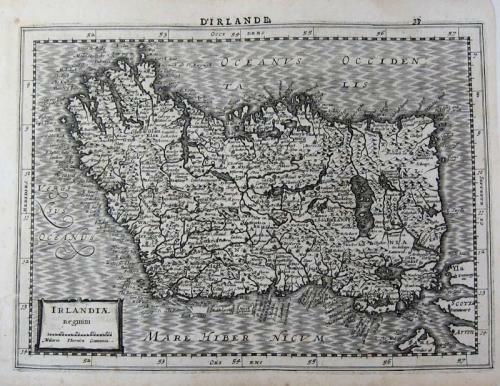 A fine, original, copperplate-engraved map of Ireland, from the first Cloppenburgh edition of the large-format Mercator-Hondius Atlas Minor, published in Amsterdam, 1630. From: MERCATOR, Gerard (1512 - 1594). Atlas sive Cosmographicae Meditationes de Fabrica mundi et fabricati figura. De novo multis in locis emendatus novisque tabulis auctus Studio Judoci Hondii. Amsterdam: Johannis Cloppenburgh, 1630. The maps in the Cloppenburgh editions (their were only two, this first, French edition, and a subsequent Latin edition in 1632), although based on the earlier, standard editions, were fresh engravings and consderably larger than the maps in the other editions of the Atlas Minor. Jodocus Hondius (Mercator's son-in-law, and heir) published the first edition of the Atlas Minor in 1607, introducing small format atlases so that 'a larger public might have access to the use of maps' (Koeman). The Hondius plates went through many editions and were eventually sold in 1621 to a London publisher. In 1630 Cloppenburgh, published this French edition in a slightly larger format with many of the copperplates engraved by Pieter van der Keere. Excellent condition; (minor, skillful repair to one or two places along the edges by a professional paper restorer.) A fine and scarce map.